Detailing the physical features, habits, territorial reach and other identifying qualities of the Whirligigs. 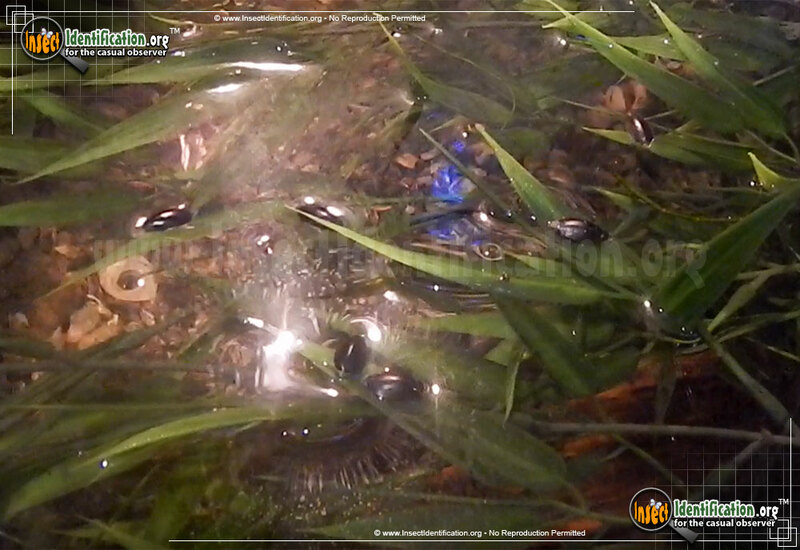 Crazy fast and furious spirals best describe the swimming patterns of Whirligigs, small aquatic beetles that are fun to watch. Whirligigs have four eyes: two above and two below water. This allows them to see through both media simultaneously. Their middle and hind legs are shaped more like a fin or paddle making them agile in the water. Though small as individuals, a large cluster of Whirligigs seen spinning about can contain outrageous numbers of them. They feed on detritus and small aquatic insects in water and can dive under whenever they like. They cannot breathe underwater so they capture and carry air bubbles when at the surface and take them below to respire. Whirligigs have a milky chemical defense that they secrete when under threat. Its odor is perceptible to humans and is described unpleasant. The members of this genus prefer calmer waters like lakes and ponds, but are fine in rivers and streams. Whirligigs are mesmerizing to watch.